Introduction: The world's population is ageing rapidly. India too, is in a phase of demographic transition and there has been a sharp increase in the number of elderly persons. Getting older can bring many health challenges to the elderly including neuropsychiatric disorders. Among the neuropsychiatric disorders, depression is the commonest and poses a substantial public health problem contributing significantly to the global burden of the disease. This study was conducted with the objective to determine the prevalence of depression among the elderly and to find out the associated factors. Materials and Methods: A community based cross sectional study was conducted among the elderly residing in the Urban Field Practice Area of Community Medicine Department, RIMS, Imphal from October 2014 to September 2016. Data was collected by interview method. Mini Mental State Examination (MMSE) was used as a screening tool to rule out dementia. Geriatric Depression Scale-30 (GDS-30) which was translated into the local language was used to identify those individuals having depression. Descriptive statistics such as percentages, mean and standard deviation were used to summarize the data. Chi-square test was used for testing the association between depression and selected socio demographic variables. Results: The prevalence of depression was found to be 29.4% in this study. In Univariate analysis age, education, occupation, marital status, type of the family, financial dependency, health condition and limitation of daily activities were found to be significantly associated with depression. In multivariate analysis only age was found to be significantly associated with depression. Conclusion: Depression is common in this study area and more so among oldest old, illiterates and widowed elderly. These study findings can help program managers implement a more comprehensive strategy in this community for timely interventions to promote mental health and prevent geriatric depression. The world's population is aging rapidly. The World Health Organization has estimated that between 2015 and 2050, the proportion of the world's older adults, aged 60 years, and above is estimated to almost double (12%–22%). India too is in a phase of demographic transition. There has been a sharp increase in the number of elderly persons between 2001 and 2011 and is currently having the second largest elderly population in the world. It has been projected that by the year 2050, the number of elderly people in India would rise to about 324 million. Older people face special physical and mental health challenges which need to be recognized. Getting older can bring many health challenges to the elderly: arthritis, diabetes, heart diseases, respiratory diseases, osteoporosis, cancer, neuropsychiatric disorders, etc. Among the neuropsychiatric disorders, depression is the most common and poses a substantial public health problem which contributes significantly to the global burden of the disease. Moreover, there is an apparent increase in the incidence and the prevalence of depression among the elderly. Depression in older adults differs in both subtle and obvious ways from depression in the younger people in terms of presentation, etiology, risk and protective factors, and potential outcomes. Depression increases the risk of cardiovascular diseases and death from these. Depression also increases the risk of suicide among the elderly. Multiple social, psychological, and biological factors determine the level of mental health of a person at any point of time. Symptoms of depression in older adults are often overlooked because they coincide with other problems encountered by them. The greatest uncertainty relates to their co-occurrence with somatic syndromes which are common and poorly understood. This study was conducted with the objective to determine the prevalence of depression among the elderly and to find the associated factors. A community-based cross-sectional study was conducted in the Urban Field Practice Area of Community Medicine Department, Regional Institute of Medical Sciences, Imphal. It is situated about 3 km from the institute. The study area has six well-defined localities, namely, Thangmeiband Sinam Leikai, Neikanlong, Langol Tarung, Grace Colony, Guigailong, and Ramgailong. From the family folder records maintained by the department, the total number of household in the study area was found to be 643 with a population of 3478. The number of elders residing in the study area was estimated to be around 278 based on the percentage of elderly of 8% according to census 2011. However, the number of elderly identified from the family folder records was 267. The population consisted of mainly Hindus and Christians. All the elderly people aged 60 years and above residing in the study area during the study period were included in the study. Those who were not willing to participate, subjects with dementia, very ill, severe deafness, severe articulation disorder, and those who cannot be contacted on three consecutive visits were excluded from the study. The study was carried out from October 2014 to September 2016. Taking the prevalence of depression among the elderly as 31.4%, absolute allowable error as 6%, and 95% confidence level, the sample size was calculated to be 230. Taking 10% as nonresponse rate, the final calculated sample size was 253. Since the total number of elderly in the study area is only 267, all the elderly were approached for the study. The purpose of the study was first explained to the participants, and consent was taken before collection of the data. Data were collected using a questionnaire which includes sociodemographic characteristics, personal habits, vital events, activities of daily living, any illness of self, and any illness of family members. Before administering the study questionnaire, Mini-Mental State Examination (MMSE) was first used to screen the participants for dementia. The MMSE is a series of questions and tests that test a number of different mental abilities including a person's memory, attention, and language. Any individual whose score was ≥24 points among literate and 19 among illiterate (out of 30) indicates a normal cognition. The study participants were assessed for depression with a validated Geriatric Depression Scale-30 (GDS-30). The GDS consists of 30 questions with dichotomous “yes” or “no” answer. A person with scores 0–9 was taken as normal while those scoring 10–19 as mild depression and 20–30 as having severe depression. For analysis purpose, depression was grouped into two groups such as no depression (score 0–9) and depression (score 10 and above). The GDS has high reliability with a Cronbach's alpha coefficient of 0.94 and high levels of sensitivity (92%) and specificity (89%). Financial dependency was assessed by asking the elderly individual's main financial provider. If the main source was the elderly himself/herself, then the elderly was categorized as financially independent. If not, then they were classified as financially dependent. Health status among the elderly was assessed through self-reported data on history of illness and the presence of medical records and treatment history. For activities of daily living, an elderly was categorized as having limitation in activities of daily living if he/she needed the help of other persons in performing any of the following activities: bathing, dressing, eating, getting in or out of bed or chairs, using the toilet, and getting around inside the house. The questionnaire was translated into local language (Manipuri) and back translated to English to check for consistency. Ethics approval was obtained from the Research Ethics Board, RIMS, Imphal. Informed written consent was taken from the participating individuals. Statistical analyses were performed using SPSS IBM Statistics version 21.0 (Armonk, NY, IBM corp). Descriptive statistics such as percentages, mean, and standard deviation were used to summarize the data. Logistic regression analysis was carried out to determine the predictors of depression. P < 0.05 was considered statistically significant. A total of 267 elderly were approached for the study. Of these, 6 had dementia, 8 were not willing to participate, 7 could not be contacted even after three consecutive visits, and 6 were very ill. Therefore, only a total of 240 elderly individuals participated in the study. The overall response rate was 89.8%. The mean age of the respondents was 68.7 ± 7.7 years with a range of 60–90 years. [Table 1] shows the sociodemographic characteristics of the study population. Of the 240 participants, a little more than the half were females (55.4%). Majority of the respondents (63.8%) were in the age group of 60–69 years. More than half of them were of the Hindu faith (53.3%). About one fifth (21.7%) were illiterate. Almost half of the respondents were unemployed (42.1%). Majority of the respondents were currently living with their spouse (67.5%). Majority of the respondents were living in a joint family (84.2%). The prevalence of depression in this study was found to be 71 (29.6%), and 169 (70.4%) elders were found not to have depression [Figure 1]. 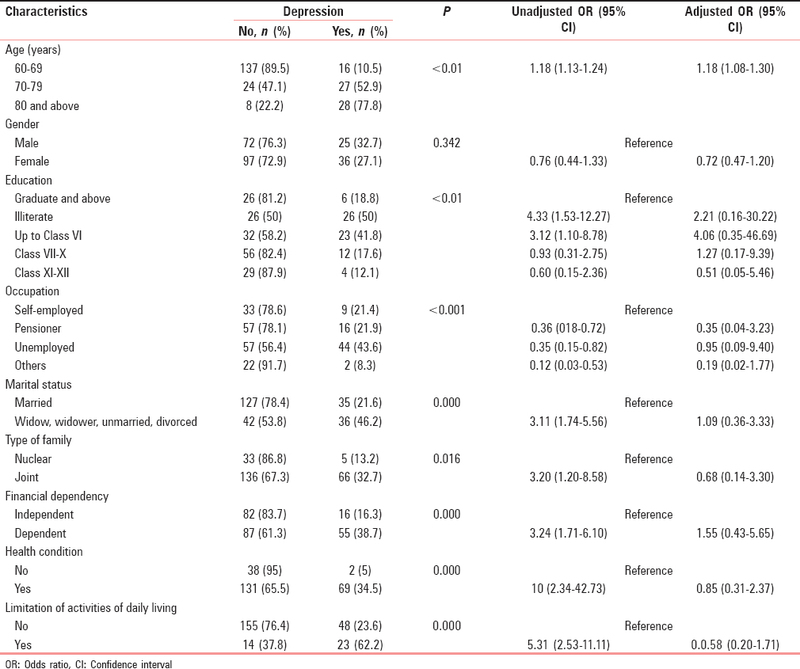 [Table 2] shows that age, education, occupation, marital status, type of family, financial dependency, health conditions, and limitation in activities of daily living were found to be significantly associated with depression in univariate analysis. Those elders who are in the older age group, illiterates, widowed, living in joint family, financially dependent, and those who have limitations in activities of daily living were significantly found to be depressed. However, in the multivariate analysis, only age was found to be significantly associated with depression ([odds ratio [OR]: 1.18 [1.08–1.30]). In this study, we found that the prevalence of depression was 29.6% which is quite high. The finding was similar to Kamble et al. (31.4%) and Chalise and Laxmi (29.7%). However, the prevalence of depression in India was reported to be ranging from 6% to 64%. Defining a case by different study instruments may be one of the factors which has contributed to this huge variation in the prevalence rate of depression in India. The difference can also be due to the differences the way people look at and care for the elderly in different cultures, regions, and various socioeconomic factors. Depression is found to be higher as the person gets older (OR 1.18 [1.08–1.30]). This trend is found to be significantly associated. It was found that those aged 80 years and above are more depressed (77.8%) than those who are younger. Gender was not found to be statistically associated with depression which was similar to the finding reported by Ganguli et al. This can be due to the fact that females are treated equally in terms of education, respect, job opportunity, etc., Education was also not found to be significantly associated with depression. Similar findings were also reported by Kamble et al. and Bhattacharya et al. Unemployment was also not found to be significantly associated with depression. In this study, employment was taken as any activity which is income generating and not as participation in any activity whether income generation or not. This is one of the limitations as the ability to participate in any activity may have an inverse relation with depression but could not be reflected in this study. Seby et al. reported that married persons are less likely to be depressed unlike in this study. Analyzing by taking staying unmarried and becoming single after the spouse died together and also not taking the time factor when they lost their spouse may have diluted the effect of association between the depression and marital status because losing a spouse may particularly in the late stage may manifest as depressive symptoms. In this study, the prevalence of depression among the elderly was found to be fairly high in this part of the country (29.4%). Depression is common in this study area and more so among oldest-old, illiterates, unemployed, and widowed elderly. These study findings can help program managers to implement a more comprehensive strategy in this community for timely interventions to promote mental health and prevent geriatric depression. Till now, there are no specialized geriatric clinics in the state. Therefore, general physicians and other healthcare professionals need to be sensitized about geriatric depression and its risk factors. When dealing with older adults, health personnel must always keep in mind the possibility of depression as it frequently manifests with somatic symptoms for which patients usually visit nonpsychiatric outpatient departments. Further, population-based studies need to be carried out, especially in rural areas too, to estimate the prevalence of depression. Mental Health and Older Adults. Available from: http://www.who.int/mediacentre/factsheets/fs381/en. [Last accessed on 2014 Jul 30]. Barua A, Das A, Nagaraj K, Bhat HV, Nair NS. 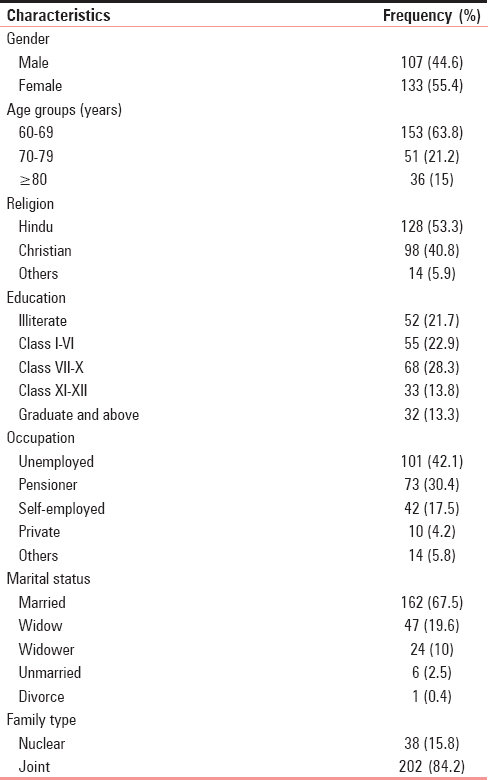 Depression in elderly: A cross-sectional study in rural South India. J Int Med Sci Acad 2007;20:259-61. Ingle GK, Nath A. Geriatric health in India: Concerns and solutions. Indian J Community Med 2008;33:214-8. Goodwin GM, Handley WA. Depression and associated physical diseases and symptoms. Dialogues Clin Neurosci 2006;8:259-65. Fiske A, Wetherell JL, Gatz M. Depression in older adults. Annu Rev Clin Psychol 2009;5:363-89. Central Statistics Office Ministry of Statistics & Programme Implementation Government of India 2011. Situation Analysis of the Elderly in India; 2011. p. 1-50. Available from: http//www.mospi.nic.in/mospi_new/upload/elderly_in_india.pdf. [Last accessed on 2014 Jul 30]. Yesavage JA, Brink TL, Rose TL, Lum O, Huang V, Adey M, et al. Development and validation of a geriatric depression screening scale: A preliminary report. J Psychiatr Res 1982-1983;17:37-49. Chalise HN, Laxmi RS. Prevalence and correlates of depression among Nepalese Rai older adults. J Gerontol Geriat Res 2013;2:2167-82. Rao AV, Madhavan T. Gerospsychiatric morbidity survey in a semi-urban area near Madurai. Indian J Psychiatry 1982;24:258-67. Bhattacharya A, Sarkar J, Baur B. 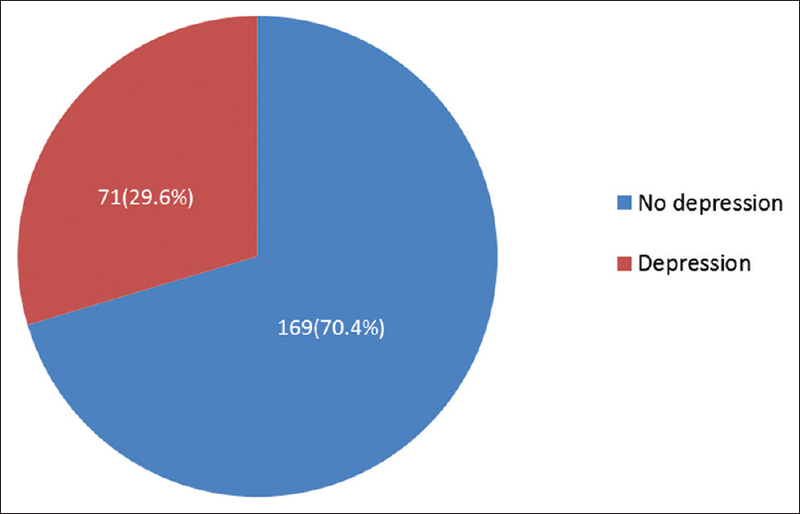 Prevalence of depression among geriatric population in an old age home in Kolkata-High time for us to take notice. East J Psychiatry 2014;17:27-30. Ganguli M, Dube S, Johnston JM, Pandav R, Chandra V, Dodge HH. Depressive symptoms, cognitive impairment and functional impairment in a rural elderly population in India: A Hindi version of the geriatric depression scale (GDS-H). Int J Geriatr Psychiatry 1999;14:807-20.